It's Day20 of Blog Marathon and I am back with yet another diy for you all! Today I am gonna share a diy face mask recipe for whitening and glowing skin. 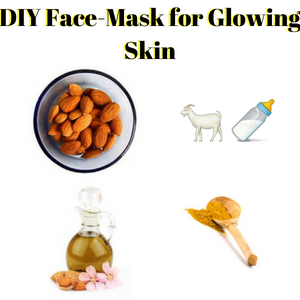 This mask has all the needed ingredients to make your skin glow(Goat milk, turmeric, grinded almond and almond oil). I have used this mask only once so far but still can swear by it. This mask works wonder on my skin( it works on all skin types). Being said that, you have to also take care of your lifestyle coz' this mask will make your skin glow for short term and from outside only. To make your skin glow from inside in longer run, you need to take care of your lifestyle. You need to have a healthy lifestyle which means you have to take care of your food, sleep, physical and spiritual health. All these factors contribute to your over all health including having good skin. So, eat healthy, exercise daily, drink enough water, sleep at least for 6-8 hours, do yoga and meditation. All of these habits will works wonder for you and your skin! Soak almond over night and then in the morning grind them smoothly. In a small bowl add almond oil, turmeric and goat milk. Add grinded almond in above mixture and mix it well. Once it's done, apply the mask all over your face, hand and feet. Let it be there for 10-20 minutes and then exfoliate it off with warm water. Pat your skin dry and apply either moisturizer or serum or toner whatever suits you the best. This mask will even out your skin, it can also remove dark spots by lightening and exfoliating your skin. Goat milk makes your skin super soft, and lighten your dark spots or discoloration. Almond oil can be used to gently dislodge debris from deep within skin pores and follicles, and also may help prevent future acne because of its vitamin A content. Almond contains the Vitamin E which is helpful in the skin care. It helps to reduce wrinkles and fine lines. It will nourish, rejuvenates and make your skin glow. The antibacterial properties of turmeric aid in acne treatment. And its anti-inflammatory properties treat the inflammation caused by pimples. Applying turmeric directly to the face and body will leave your skin feeling refreshed and re-hydrated. In-a nutshell this mask will work magically on your skin! Try this mask and let me know it worked for you! If you have any mask you would like to share with all of us, drop that in the comments!